An impressive twist on the traditional fish and chips, Cory Campbell’s crisp skinned barramundi is a beautiful dish to share with friends and loved ones. If you’re stuck for time, you can prepare the tartare sauce in advance or simply replace it with a premade bottle at the supermarket. Wash Kipfler potatoes and add to a large pot. Cover with water and add generous amount of salt to season. Bring to the boil and turn down heat to simmer. Boil until potatoes are cooked, then remove from water and allow to cool a little. Preheat oven to 200°C. One at a time, squash potatoes flat and place in an oiled baking tray. Drizzle with 100ml olive oil and season with salt and chopped herbs. Place potatoes in oven and roast until the edges are golden and crisp but still soft and fluffy in the centre. Meanwhile, combine onion, parsley, cornichons, mayonnaise, apple cider vinegar, Dijon mustard and lemon juice in bowl and whisk together to make a tartare sauce. To create the citrus salad dressing, combine orange juice, apple cider vinegar, 40ml olive oil, shallot, fennel seeds and salt and pepper to season. Heat fry pan to medium-high heat. Pat the barramundi dry then season with salt and 50ml olive oil. Pour a small amount of oil into pan and wipe it around with kitchen paper. Carefully place barramundi skin-side down into the pan, adding a little pressure to the fish so it doesn’t curl up. 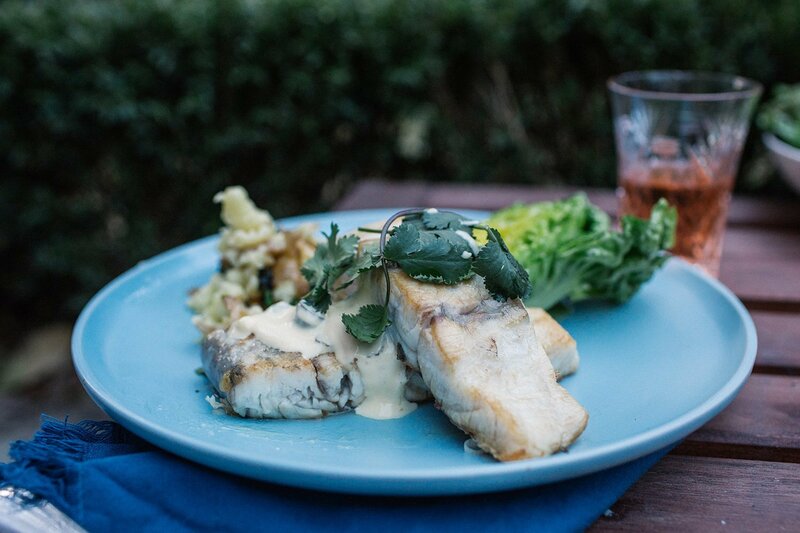 When skin is golden and crisp, carefully flip barramundi. Add butter and leave to foam. Turn heat down to medium low and allow fish to cook through. Turn off heat, remove barramundi from pan and place onto a tray or plate lined with kitchen paper, skin-side up. Pick down and wash the baby cos lettuce before placing in large bowl. Tear mint leaves into 3-4 pieces and sprinkle over cos.
To serve, place hot smashed potatoes into a serving bowl, dress salad and sprinkle with lime zest, and spoon tartare sauce over barramundi. Enjoy!